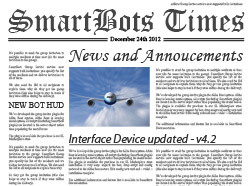 We’ve rolled out a bulk update of SmartBots essential devices: Interface Device and Personal Bot HUD. Local-chat API support has been completely removed. We suggest using Simple Group HTTP API instead. New HUD version will be sent to you when you switch bots using the old version. You can request the new HUD immediately in your account (“Your personal bots” >> “Get bot control tools…”). In addition to these updates, the move command of HTTP API has been improved: it now supports FLY instruction which enables or disables flying.